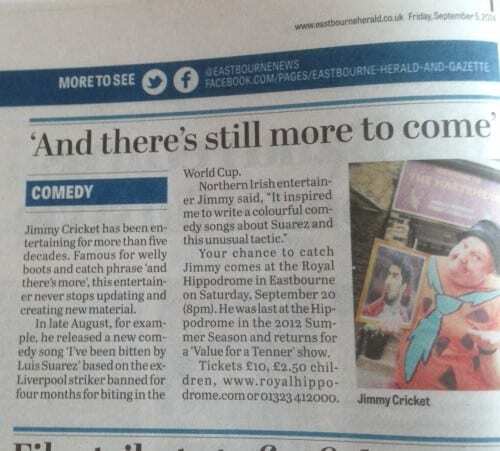 Jimmy Cricket is returning to the scene of his 2012 summer season to do his stand-up comedy show at the weekend. The famous Irish entertainer will perform at the Royal Hippodrome Theatre in Eastbourne on Saturday (20 September), two years after his last appearance there. The newspaper mentions that Jimmy has just released a song, I was bit by Luis Suarez, which is based on the former Liverpool striker who was banned for four months during this summer’s World Cup for biting an opponent. Jimmy said: “I am looking forward to seeing the many friends I made during that summer season. They include Jerome and Carole who own and run the Marine Parade Hotel and Darren Weir who owns the Mowbray Hotel. Another friend Jimmy will be seeing again is Mike Lee, who is also a partner in the management consortium. To watch the video of I was bit by Luis Suarez, go to the homepage of this website or visit Jimmy’s video channel at YouTube. And you can pre-order I was bit by Luis Suarez at iTunes. For all the latest updates on the song and on Jimmy’s schedule and thoughts, go to his Twitter page. Jimmy Cricket’s new song, I was bit by Luis Suarez, has gone worldwide since its release over all digital outlets a week ago. In addition to being available at iTunes, Amazon and Tesco, it has even been spotted on a Taiwanese online music store! And media coverage of the song, which is based on the Uruguay and former Liverpool striker who was banned for four months for biting Italy defender Giorgio Chiellini during the World Cup in Brazil this summer, has been far and wide too. As well as being featured in the Daily Mirror and in its sister publication, the Irish Mirror, Jimmy’s tune has made it to Africa and to the United States of America. For anyone interested in an actual CD copy of the song, it can be purchased for £2.50 by ringing the record label Rolling Tear who are the distributors. They can be contacted on 07931 528435. And there’s more – the B side for the single is a karaoke singalong version of the song! Jimmy said he was thrilled about the response so far, adding: “I have just been blown away with the interest that has been generated by this comedy song. To watch the video of the song, visit Jimmy’s video channel at YouTube here. For all the latest updates on the song from Jimmy, go to his Twitter page. 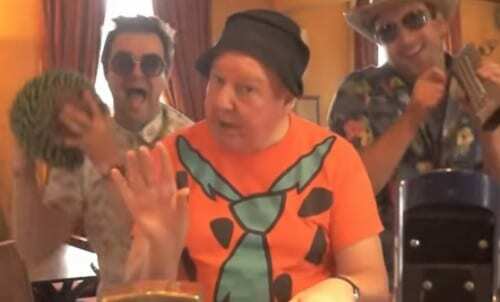 The most controversial incident at this summer’s 2014 World Cup in Brazil is the subject of Jimmy Cricket’s latest comedy song. I was bit by Luis Suarez is based on the Uruguayan and former Liverpool striker who was banned for four months for biting Italy defender Giorgio Chiellini during the group match between the two national sides in June. The idea of the song was picked up by a specialist comedy record label that has just been created called Rolling Tear. The company is based near Dewsbury in West Yorkshire. Rolling Tear arranged for Jimmy’s track to be recorded and also organised for an accompanying music video to be filmed. 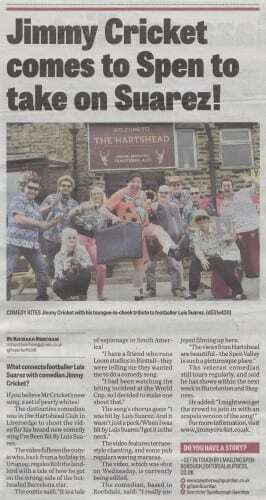 During the filming, which took place at the Hartshead Social Club in Liversedge, Kirklees, the local newspaper sent a photographer to gatecrash the video shoot. The Spenborough Guardian then featured Jimmy’s filming day in one of their editions. 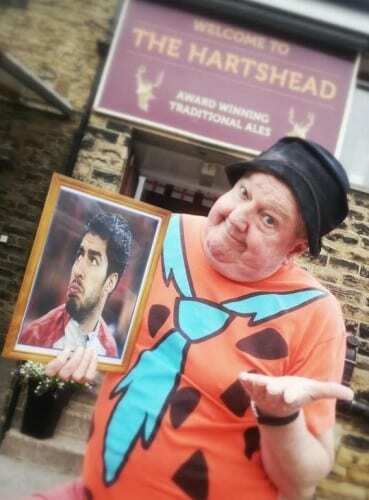 The article, published earlier this month, said: “The video follows the comic who, back from a holiday in Uruguay, regales Rob the landlord with a tale of how he got on the wrong-side of the hot-headed Barcelona star [Suarez joined Barcelona from Liverpool this summer]. “The comic said: ‘It is a tale of espionage in South America! “‘I have a friend who runs Loom Studio in Birstall, Leeds– they were telling me they wanted me to do a comedy song. The song with video is officially released on Tuesday 26 August and will be available from all major digital outlets. For a sneak preview, visit Jimmy’s video channel at YouTube here. And you can pre-order the song at iTunes here. Thanks to photographer Jake O for the photos which appeared in the Spenborough Guardian. Rochdale-based Jimmy Cricket crossed the Pennines to attend his niece’s wedding reception at the end of August. Lindsay and Chris actually got married at Lake Garda in Italy, but on their return to Leeds they wanted to have a celebration for all their family and friends who could not make the ceremony. The evening’s entertainment at Morley Rugby Club was provided by Lindsay’s brother and Northern Irish-born Jimmy’s nephew, David, who sang and played the keyboard alongside David Tattersall, a singer and guitarist. They created delightful harmonies and the repertoire they chose for the occasion was a fine array of modern and classic pop songs. 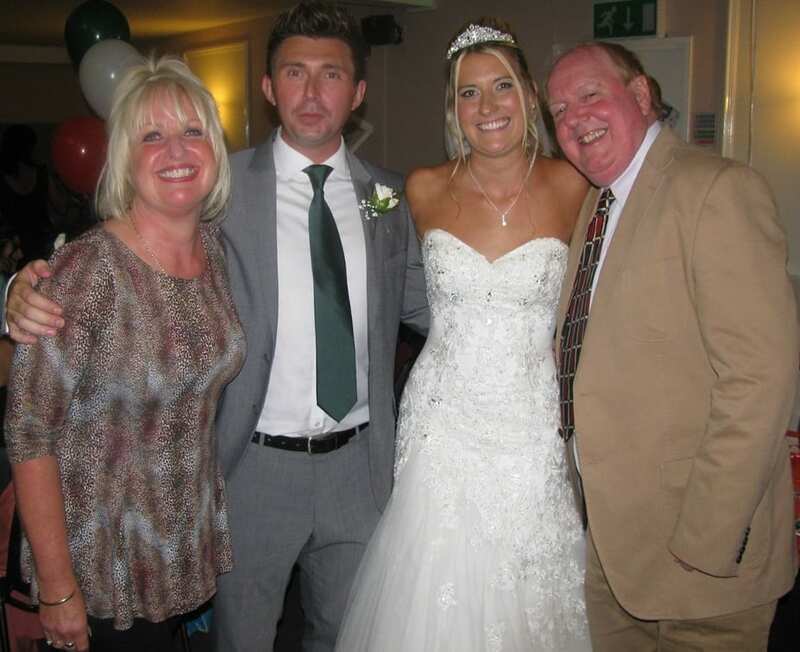 The happy couple thanked everyone for their attendance, with a special mention to both their mums who, over the course of the night, looked after their one-year-old daughter, Brooke. Above, the happy couple have the first dance of the evening to music performed by the two Davids and, below, Jimmy with wife May and the newly weds.